Thaddeus Cowan "Thad" Lewis (born November 19, 1987) is an American football quarterback for the San Francisco 49ers of the National Football League (NFL). He was signed by the St. Louis Rams as an undrafted free agent in 2010. He played college football at Duke. Lewis has also been a member of the Cleveland Browns, Detroit Lions, Buffalo Bills, Houston Texans and Philadelphia Eagles. Lewis played at Hialeah-Miami Lakes High School. As a senior, he was evaluated as the nation's 10th-best dual-threat quarterback and 65th-best quarterback overall. He led his team to the state playoffs that year, passing for 12 touchdowns and only three interceptions. Lewis played college football for the Duke Blue Devils. While at Duke he set school records for career passing touchdowns and career passing yards. He also set Duke's school record for most consecutive pass attempts without an interception, 206. During his four years as a starting quarterback, he threw for 10,065 yards, 67 touchdowns and 40 interceptions, and ran for 9 touchdowns. During his senior season Lewis was a finalist for the Davey O'Brien Award, presented to the nation's top quarterback. Lewis signed with the Rams as an undrafted free agent soon after the 2010 NFL Draft. The Cleveland Browns claimed him off of waivers on September 4, 2011. Lewis was later waived by the Browns on October 11, 2012. He was signed to the practice squad on October 13, 2012. He was again added to the Cleveland Browns active roster December 24, 2012 after injuries to Brandon Weeden and Colt McCoy. He made his first career start when the Browns took on the Pittsburgh Steelers on December 30, 2012 and completed 22 of 32 passes for 204 yards with one touchdown and one interception. Notwithstanding Lewis' performance, the Browns lost 24-10. This performance was particularly noteworthy due to his strong performance against the first-ranked defense of the NFL during the 2012 season. Lewis was waived by the Browns on May 22, 2013. The Detroit Lions claimed him off waivers on May 28, 2013. He looked to compete with 2012 undrafted free agent and former Heisman Trophy finalist Kellen Moore for the third quarterback position. On August 25, 2013, the Buffalo Bills traded linebacker Chris White for Lewis, due to the mounting quarterback injuries for the Bills. He was released on August 31, 2013 and signed to the practice squad September 1. On October 7, 2013, coach Doug Marrone announced on WGR Radio 550 that Lewis was promoted to the active roster from the practice squad after an injury to EJ Manuel and started week 6 against the Cincinnati Bengals, over undrafted rookie Jeff Tuel, where he went 19/32 for 216 yards with 2 passing touchdowns and 0 interceptions and added 7 carries for 17 yards and 1 rushing touchdown. The Bills lost the game in overtime by a score of 27-24. On October 20, 2013, Lewis went 21/32 for 202 yards with no touchdown passes and 1 interception. He also had 5 carries for 13 yards as he earned his first career victory against the Miami Dolphins by a score of 23-21. In a week 8 loss to the New Orleans Saints, Lewis completed 22 of 39 passes for 234 yards, 1 touchdown and 1 interception along with 2 rushes for 5 yards. This game is arguably his worst as he fumbled the ball 3 times. On November 3, 2013 against the Kansas City Chiefs in week 9, Jeff Tuel was named the starting quarterback, only to be replaced the following week by the original week 1 starter, E.J. Manuel. Manuel started the next 5 games against the Pittsburgh Steelers, New York Jets, Atlanta Falcons, Tampa Bay Buccaneers, and Jacksonville Jaguars. Lewis received his second win as a member of the Bills during week 16 in a shut out victory over their division rival, the Miami Dolphins, with a score of 19-0. He went 15/25 for 193 yards with zero touchdowns and 1 interception while adding 8 carries for 13 yards. This loss would be a major factor for the Dolphins not making the playoffs since they needed to win just one of their final two games for a wildcard spot; which they lost both. In his final game as a Bill, Lewis played at Foxborough Stadium against Tom Brady and the New England Patriots. Although Lewis outshined Brady on that day, by throwing for more yards than him and not throwing an interception like Brady did, his team lost to the Patriots by a score of 34-20. Lewis went 16/29 for 247 yards with 1 touchdown and no interceptions. He also added 2 carries for 4 yards. Thad Lewis finished his 2013 Bills season with a 2-3 record as Buffalo's starting quarterback. On August 26, 2014, Lewis was released from the Bills. Lewis signed with the Houston Texans on November 24, 2014, after starting quarterback Ryan Mallett suffered a season-ending injury, but he was released in that same offseason. The Browns signed Lewis on March 12, 2015. He was released from the team on September 5, 2015. Lewis signed with the Philadelphia Eagles on September 21, 2015. Lewis signed with the San Francisco 49ers on March 10, 2016, reuniting him with former Eagles coach Chip Kelly. On August 16, 2016, the 49ers placed Lewis on the injury reserve. ↑ Associated Press (2012-12-26). "Browns ink QB Johnson; Weeden, McCoy miss practice". Yahoo! Sports. Retrieved 2012-12-26. ↑ "Thad Lewis gets first NFL start at QB for Cleveland Browns". National Football League. 2012-12-27. Retrieved 2012-12-28. ↑ "Steelers Number one Defense of 2012". National Football League. 2012-12-27. Retrieved 2013-02-04. ↑ Pelissero, Tom (2013-08-25). 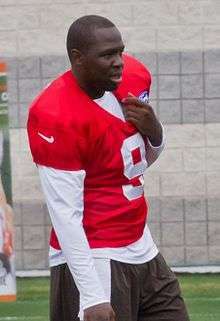 "Bills sign QB Matt Leinart, trade for Thaddeus Lewis". USA Today. Retrieved 2013-08-25. ↑ Wilson, Aaron (2013-09-01). "Bills add five to practice squad". Yahoo! Sports. Retrieved 2013-09-01. ↑ Sessler, Marc (November 24, 2014). "Thad Lewis agrees to terms with Houston Texans". nfl.com. Retrieved November 24, 2014. ↑ Gribble, Andrew (March 12, 2015). "Browns sign QB Thaddeus Lewis". ClevelandBrowns.com. Retrieved 2015-08-02. ↑ "Cleveland Browns reduce roster to 53". ClevelandBrowns.com. September 5, 2015. Retrieved September 25, 2015. ↑ Berman, Zach (September 21, 2015). "Eagles sign QB Thad Lewis, release Stephen Morris". Philly.com. Retrieved September 21, 2015. ↑ "49ers sign quarterback Thad Lewis to one-year deal". ESPN.com. Retrieved 11 March 2016. Wikimedia Commons has media related to Thaddeus Lewis.